A box of 1000 disposable white plastic 12oz sip lids, which are designed to be used with both the 12oz and 16oz paper cups. These plastic lids will also fit most other disposable paper cups. 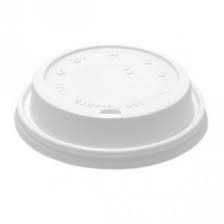 A small sip-hole has been incorporated in the top of these sip lids, perfect for sipping hot coffee, tea or any other hot drinks, without removing the domed plastic lid. These dome shaped lids are perfect for securely sealing your 12oz/16oz paper cups when serving takeaway cappuccinos, lattes and other hot drinks.